I've just finished making my first zine, now I won't be going into all the details of how it was made but I will share some of the process. This all started with conversations with Jon Wilkening, and we touched on the early progress when I was a guest on his podcast. Most of my projects start in my daily journal, that is where the majority of ideas, doodles, scribbles and information goes. A journal is a great way to keep all that information but it can be poorly organized and hard to find information as days turn into weeks and months; good ideas don't stay, they change, they evolve to become better ideas or worse ideas and I like to have a record of them all. 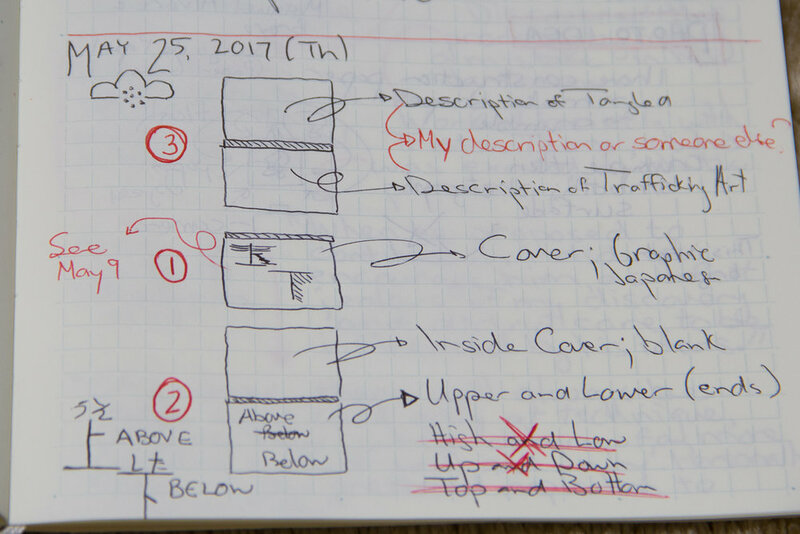 A journal has one drawback; it's been months since you've been working on a project can you recall on what day you wrote down that layout idea? Where was the name of that paper you found? Where is that sketch for the cover you had? One simple solution is to use an index card to jot down relevant dates & info. This was one of the original ideas, incorporating two separate projects into one (Tangled & Trafficking Art). However those had a combined total of 195 images (most of which have never been seen before by anyone besides myself), that's a lot to whittle away. At first I thought I could make several volumes — however that could quickly become boring, they'd basically look the same. I do like the idea of both projects living together, and have plans for it in the future. For the first project though I figured it best to keep it simple, one zine for one project while I learn the basics. 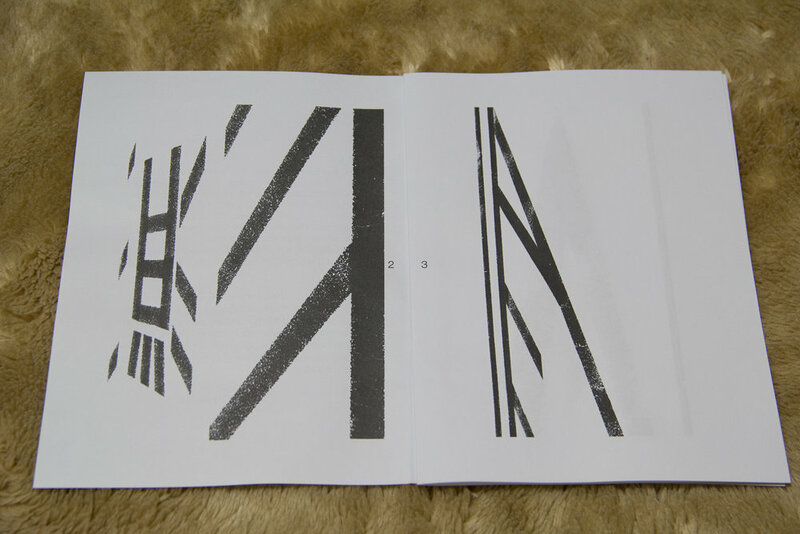 At first the idea was to have the zine printed by a print company (an issue with a PDF error stopped that plan — and added extra time to the project due to frustrations). Then I figured I might as well self-publish the entire thing, and rather than staple it I could bind it myself — not as daunting as it sounds (I used this page & this one as guides). It wasn't too tricky, but took some patience, a couple of punctured finger tips, torn paper and slipped knots. Eventually I figured it out (mostly). 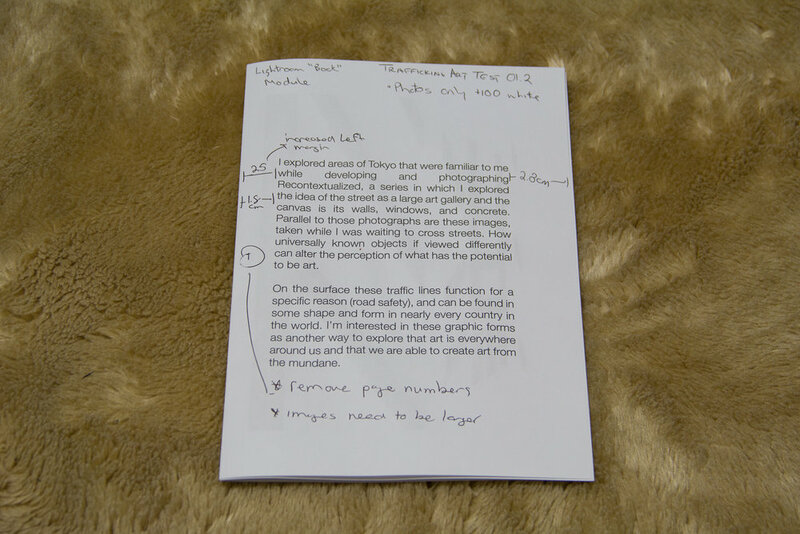 Early tests of the zine for layout and fonts — what looks good on the screen doesn't necessarily translate onto paper. I ran into a problem with the paper warping when it dried, there was a lot of black ink in each image — I was able to come up with a solution, inverting the images. That added some extra time to edit, but by this point I had the final 22 images selected so that cut down on the amount of work. Making test prints along the way will help you discover problems and concerns you didn't even know you had. I made small prints of the final images I selected so I could visualize how they went together, and could play with orientation, left or right side, pairings etc. I made notes on the back of which images I paired up, and taped the final pairings together, then worked on page order as well. Early on some setbacks and shipping costs lead me to think about how I could print and make the entire zine by myself. In the end I used InDesign to make the final PDF which I would print. No, I did not purchase the program, once I had the final images selected and arranged, I downloaded the 7 day trial version of the program from Adobe. This gave me a one week time constraint to get the final PDF created, and learn the basics of the program. If I failed at the end of the week I was going to move on to something different. Needless to say, I was able to learn the basics, finding out what I needed to do to get what I wanted, and through various trials and errors of printing get a final copy of the PDF (with one day to spare on the trial). I am happy with the final product, and have already noted a few places where I can improve on when I make the second volume. As I said I wasn't going to go deep into details about paper selection, image choices, margins, bleeds etc, there is so much information and tutorials (some good, many not so good) online but it also helps to have actual people who have experience; don't hesitate to ask if you have questions.